What’s a nesting band? 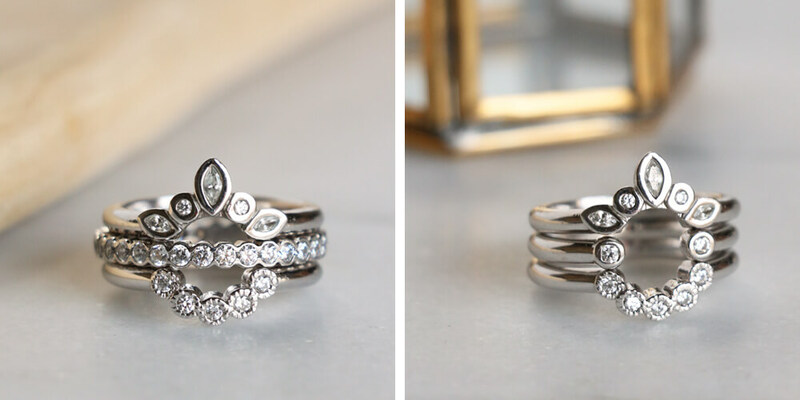 You’ve likely seen this trend—it’s a band with curves that nestles against other rings to create a totally new style. They are versatile enough to be worn with an engagement ring or on their own. Best of all, each one is unique and bold, with style that packs a punch. Meet our new collection of nesting bands and get inspired with our favorite looks. A floral-inspired band with bezel set Nexus Diamonds. The alternating pattern of Marquise and Round Brilliant cut stones makes this one of our most daring styles. Wear it with: A solitaire or simply accented engagement ring with a higher setting. Pictured with: Angelix engagement ring in white gold; Bali Oval engagement ring in rose gold; Marseille Pear engagement ring and Quest band in white gold. Inspired by a delicate tiara, this band is set with Round Brilliant cut Nexus Diamonds and accented by millgraine metalwork, which adds rich texture and subtle shimmer. 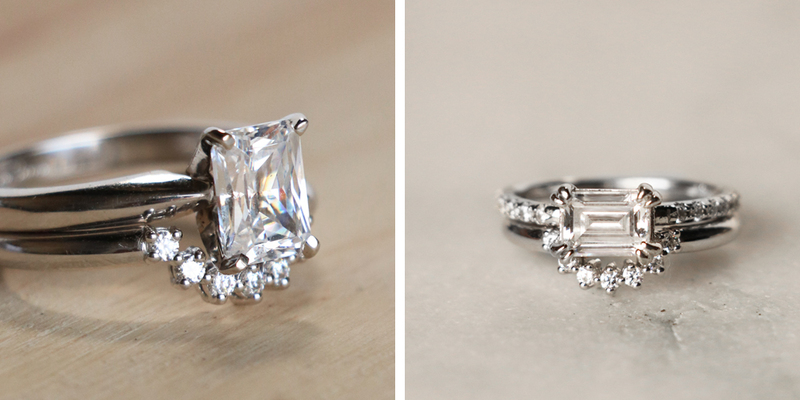 It adds femininity and detail that we love with simple solitaires. Pictured with: Montreal Pear Cut engagement ring in white gold; Verona Round engagement ring in white gold. 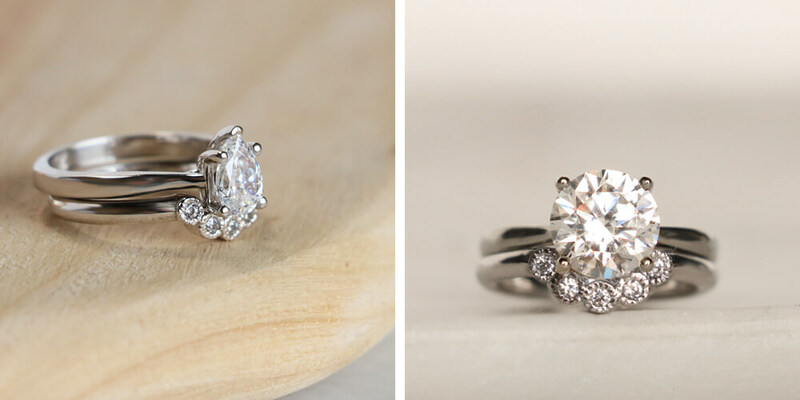 The beauty of this ring is in the simplicity. A gentle curve of Round Brilliant cut Nexus Diamonds will embrace a simple engagement ring and add extra sparkle. It is one of the more subtle nesting bands, while still creating a unique take on a wedding band. Pictured with: Tiffany-Style Radiant engagement ring in white gold; East-West Accent Emerald in white gold. One of our most unique bands, ever. The Quest is an incomplete circle that ends in two Round Brilliant cut Nexus Diamonds. 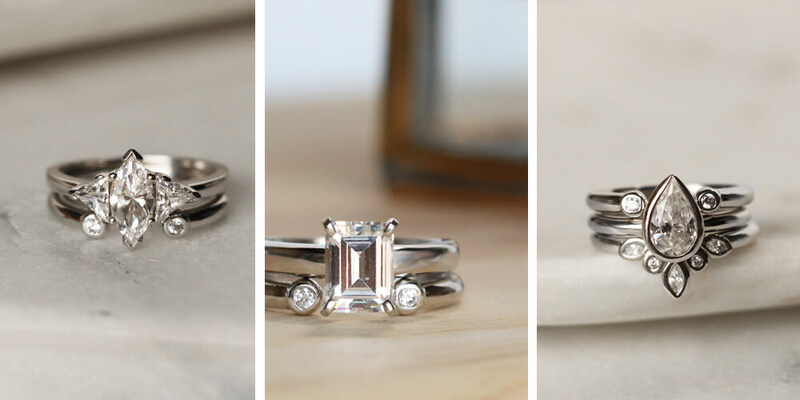 It’s a very bold, modern style that pairs beautifully with unique shaped engagement rings. Pictured with: Timeless Marquise engagement ring in white gold; Tiffany-Style Emerald engagement ring in white gold; Marseille Pear engagement ring and Queen band in white gold. With nesting bands, you can rock stacks that are limited only by your creativity. 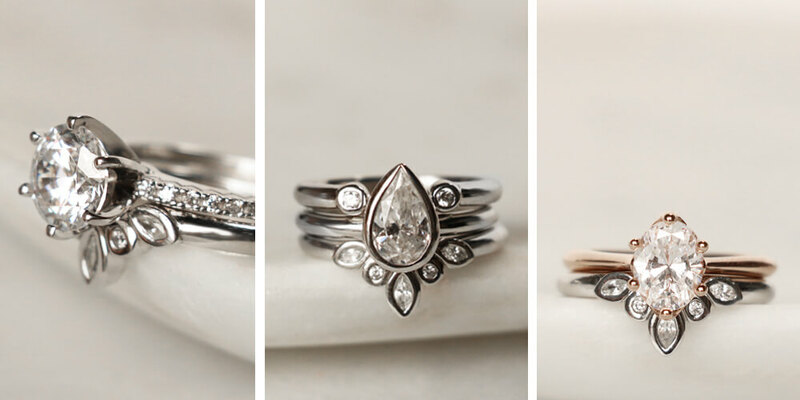 Pair two or three together, or add in an eternity band. Boom—instant style. Pictured stacks: Queen, Quest and Prestige in white gold; Queen, Radiant Grace Petite eternity band and Prestige in white gold. Which pairing is your favorite? How would you build a look with nesting bands? Tell us in the comments! Would any of the bands look right with the Rhapsody (1ct center) ring? Diamond Nexus response: Great question, Nichole! We highly recommend contacting a jewelry advisor at 800-509-4990, so they can advise on which bands could fit most comfortably with the Rhapsody. Love the concept! If this is not beautiful, I don't know what is! Gorgeous and brilliant!